only once one is out of the city for a while does one appreciate some of the most mundane and inane benefits of living in mumbai. 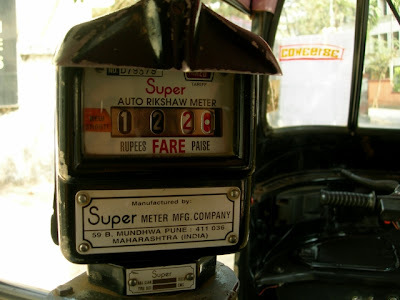 take the rickshaw meters for example. in mangalore and more so in bangalore, every time we had to catch a rickshaw, we'd have to argue and hassle about the fare before we got in. the concept of charging the passenger a fare as read on the meter seems to be non-existent, at least when it comes to non-locals. and as per the official rule book, in bangalore rick fares go up one and a half times post 9 pm and double post 11 pm! do they think that the city is a three yr old kid who is supposed to be confined to home three hours before mid-night? Everything about Mumbai is the best. The busses, the cabs, the ricks .... everything! You must come to chennai.The Bombay auto wallahs are angels.